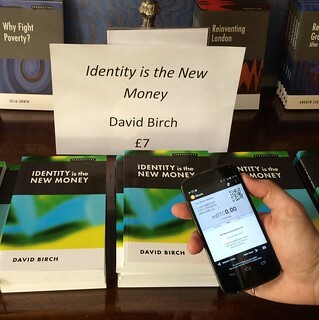 The CSFI roundtable on my book “identity is the new money” left me utterly depressed. Every single book sold was sold for cash. I will never recover from the embarrassment and public humiliation. Still, at least they sold some. 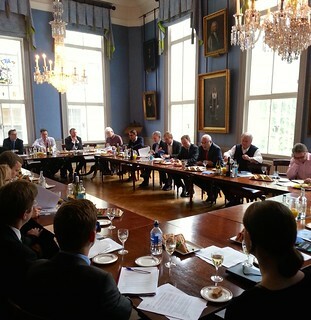 The wonderful people at the Centre for the Study of Financial Innovation (CSFI) in London did me the great honour of holding one of their super lunchtime roundtable meetings around the publication of my new book, “Identity is the New Money“. I gave a short talk on a couple of themes on the topic, starting by exploring Jack Weatherford’s meme about the future of money being more like the money of the neolithic past than the money of today and finishing with the three suggestions for UK policy makers that I finished the book with — and trying to justify them to a financial services audience which, judging from some of the questions, I didn’t do too badly at. We need to begin by finding a way to make the construction and use of a new infrastructure for identity a national project of significance. We need to find something that can provide the “parasitic vitality” for a new identity paradigms. We already know that in the UK, as well as in the USA, Australia and many other countries, there is no appetite for any kind of national identity scheme. But there may be an alternative formulation that helps all stakeholders: individuals, business, governments, law enforcement and everyone else. A National Entitlement Scheme. Long before the late and unlamented national identity scheme in the UK, there was (back in 2002) the original proposal for an entitlement card. This should be revisited in the light of modern technology. We can use the modern privacy-enhancing infrastructure to decouple these entitlements from the underlying identities and resolve the paradox of more security and privacy. One very specific use of the new infrastructure should be to greatly reduce the cost and complexity of executing transactions in the UK by explicitly recognising that reputation will be the basis of trust and therefore transaction costs. The regulators should therefore set in motion plans for a Financial Services Passport. This would use the same infrastructure as the National Entitlement Scheme but with a sector-specific profile. The UK’s IT industry trade association, TechUK, has a working group looking at just this idea already and together with colleagues at Consult Hyperion we have put forward the same suggestion to the Federal Reserve in response to their November 2013 consultation on the evolution of the US Payments System. Since the financial services passport would be using the same infrastructure as the entitlesment scheme, one might expect the costs to be manageable and then cost savings to UK plc significant. Finally, I should like to make a rather technical and boring plea to the relevant authorities to make the UK’s National Payments Plan adopt an explicit target for reducing the total social cost of payments in the UK. This will inevitably mean coming up with tactics to reduce cash (and cheque) usage in the UK. This target will be made significantly easier to attain using the Financial Services Passport to lower the barriers to entry for new products and services, increasing competition in the sector (especially with respect to the financially-excluded groups who are too expensive to serve using existing infrastructure). These are straightforward calls to action and I trust that you have been persuaded to support them! I won’t report the excellent and wide-ranging roundtable discussion that followed (which was held under the Chatham House rule) except to note that David Rennie — from the Identity Assurance Programme (IDA) in the Government Digital Service (GDS) — was kind enough to join me at the roundtable and talk about the government’s current initiatives and how they support the idea of shifting toward entitlement as the basis for transactional interaction. As is the tradition at such events, my publishers were kind enough to show up in person with a job lot of the heroic tome (plus some other titles in the Perspectives series) to knock out at the back. Despite accepting Bitcoin, Pingit, Paym and PayPal, I’m sorry to say that every single person who bought a copy paid cash. I will never recover from the shame. If we can’t persuade the nation’s financial elite to use mobile payments, who can we persuade? P.S. Available at all good bookstores and some of the bad ones too. Kindle version now available as well. For our US readers, you can buy right now online with free shipping to the US at http://bit.ly/1pdzFN0. 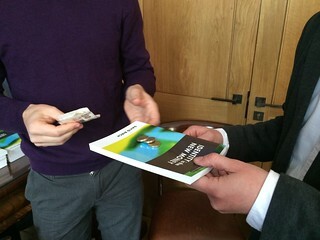 Seems entirely plausible that those with cash bought the book; no point in preaching to the converted. For all the talk of a market, nobody has explained who is selling what to whom, let alone what the tax rate might be. But if the gravy train has moved on to attributes, how do these differ from old-fashioned personal data? Did David explain why none of the services (electoral registration, student finance, power of attorney, driving record, universal credit) use IDAP, which was supposed to the live in April 2013? Did Francis Maude explain what had changed since the same money was proposed for the same numbers in October 2011? – Tomorrow’s Transactions < Loved it!